Nisus was killed in a night raid along with his good friend Euryalus during an attack on the enemy camp as described in the Aeneid. Nisus is a Trojan warrior in the Aeneid by Virgil who went on a night raid with his older friend Euryalus. Their raid was successful in killing many of the enemy soldiers, but at one point, moonlight glanced off the helmet of Nisus, allowing the enemy warriors to see where he was. He was surrounded. 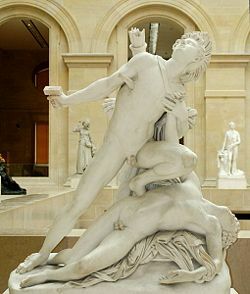 When his friend Euryalus went back to try to rescue him, he too was surrounded and killed. The incident is in contrast to the successful raid in the Odyssey by Homer in which Odysseus or, in Roman terms Ulysses, went on a night raid with a companion during the Iliad and both survived. When the mother of Euryalus learned of her son's death, she was overcome with grief. She was one of the few Trojan women to have made the passage from Sicily. One of the themes of the Aeneid is elderly grieving fathers and mothers who have lost their only son. This page was last modified 00:06, 30 March 2010.